After a terrible car accident, a woman is left without memory of the events, but a dead body at the scene speaks of something sinister. When Karen Krupp crashes her car into a pole after fleeing an abandoned restaurant in a rough part of town in upstate New York, she’s left with a bad concussion and no memory of what happened before her accident. Her husband, Tom, doesn’t know what to think since she went out without her purse and ID and didn't leave him a note as she usually does, and those are only the first in a string of out-of-character actions for Karen. The shocks keep coming when a dead man is found in the derelict restaurant, shot to death, a pair of distinctive pink rubber gloves left at the scene. Tom is convinced Karen isn’t a murderer, but as evidence piles up, he starts to doubt that he ever really knew his wife at all. 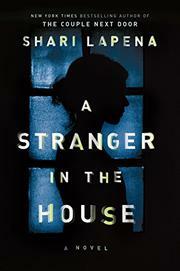 Karen won’t find comfort in her “friend” Brigid Cruikshank, who lives across the street. Poor Brigid hates her marriage to boring Bob, and all she can think about is the hanky-panky she and Tom were up to before he married Karen. Bob is inadequate, but Tom is her dream hubby, and as cracks form in Tom and Karen’s marriage, delusional Brigid only sees opportunity. Detectives Rasbach and Jennings smell something fishy and are convinced Karen is hiding something, and as they dig into her past, explosive secrets come to light. Tom is hapless and self-pitying, allowing himself to be manipulated at every turn, and Brigid, at times unintentionally funny, is the quintessential soap-opera villainess—she delights in spying on Tom and Karen through her window while knitting and nursing fantasies about Tom. Readers will guess the obligatory final twist quickly, and Lapena's (The Couple Next Door, 2016, etc.) attempts at creating any sort of suspense are crushed under the weight of predictability. Readers looking for someone, anyone, to root for won’t find it among these well-to-do suburbanites behaving badly.